Robert J. Fleming is an experienced Georgia trial lawyer whose hard work and determination have resulted in millions of dollars in recoveries for his clients. Mr. Fleming enjoys an "AV" rating in regard to his professional abilities and ethics. This is the highest rating given by the Martindale-Hubbell Legal Directory and it signifies that a lawyer has reached the height of excellence as a legal professional. This rating is the gold standard for attorneys and is derived from confidential peer evaluations by lawyers, judges and mediators throughout Atlanta, Georgia and the United States. Mr. Fleming is a senior partner at Katz Wright Fleming Dodson & Mildenhall, LLC and has offices in Decatur and Atlanta, Georgia (Buckhead). The firm employs lawyers who are licensed to practice law in a number of different states, in addition to Georgia. Mr. Fleming handles many different types of cases but has gained a national reputation for representing victims of dental malpractice and medical malpractice who have suffered serious injuries as a result of negligence. He has been regularly recognized as one of Georgia's "Super Lawyers" by Law & Politics Magazine and Atlanta Magazine. He has been admitted to practice in all Georgia and Texas State Courts, the Northern District of Georgia, and the Southern District of Texas federal courts. In addition, he has successfully litigated many dental malpractice, medical malpractice, personal injury and business litigation cases throughout the country pro hac vice (being admitted to appear in another state's courts for a specific case) with the assistance of local counsel. In this situation, Mr. Fleming would typically handle the technical aspects of the case and local counsel would be retained to ensure compliance with local rules and customs. We are patient advocates and almost always represent the injured party in personal injury, dental malpractice and medical malpractice cases. If you are reviewing our page and seeking an attorney to help you, chances are that you have been hurt badly and involved in a traumatic situation. Things are moving quickly, and you not only need, but you deserve the help and guidance of an experienced law firm. We have over 100 years' of collective legal experience and we have recovered millions of dollars for our clients in the past year alone. We understand that choosing a law firm is not easy. Our hope (and firm belief) is that the more you investigate our firm, the more comfortable you will feel about us and the choice to retain us as your counsel. Obviously, we are not the only law firm in town, but we do believe that we have the right mix of experience, results and compassion to make us the best choice for you and your case. If you have any questions or would simply like to chat in confidence about your situation or how we may be able to help you without any commitment, call us today. Every case that we handle requires the personal attention of an experienced attorney who can level the playing field by dealing with the insurance company, properly evaluating your case and getting the results that you deserve. In fact, most of the attorneys at our firm started their legal careers by working for the insurance companies as insurance defense lawyers. Because of this experience, we are very well acquainted with what factors the insurance companies consider when evaluating (and valuing) a case that we are pursuing against their insured. There are many "intangibles" that truly make a difference in the ultimate outcome of your case, and many of these must be initiated early on in the lawsuit process. Many times, well before the lawsuit is filed. There are times when the client is better served by associating counsel or referring the case to another law firm. However, unless there are unique aspects of a case that better serve the client's interests by involving other lawyers, we personally handle all cases which we accept. In the legal profession, reputation is everything. This is especially true in the Atlanta legal community, where we have earned a reputation for dogged persistence and winning. Because of this representation, Mr. Fleming has been interviewed on TV and in print regarding dental malpractice, medical malpractice and other types of cases. We are an Atlanta based personal injury and negligence law firm that has successfully handled many different types of injury cases such as wrongful death, automobile accidents, personal injury, medical malpractice, dental malpractice and pharmacy errors. Our experience, dedication to hard work, honesty and persistence has enabled us to achieve record successes. We treat the practice of law as a profession, not a business. We carefully screen all potential new clients and cases. We focus on helping individuals and families who have suffered life-changing injuries due to the negligence of others. We are proud to represent our clients and we take great pride in the legal work that we do. Each client and every case is important to us. We are here to help those victims of negligence turn their lives around and get the compensation and justice they deserve and move on with their lives. In fact, this is what our clients consistently tell us they want, i.e., to be fairly compensated for their injuries and to to get on with their lives. As attorneys, we cannot give you back your health, but we can get your fair compensation and give you all the tools to get your life back after a catastrophic injury. If you or a loved one have been injured in an accident or injured due to dental or medical negligence and you would like to discuss your case in strict confidence with an experienced Atlanta personal injury attorney, please call (404) 525-5150 or contact us online today. We are here to help. *Admission to Texas state and federal courts is on an inactive status. "Robert J. Fleming represented me in an auto accident case. I turned to him after another lawyer withdrew from my case because the insurance company would not settle. 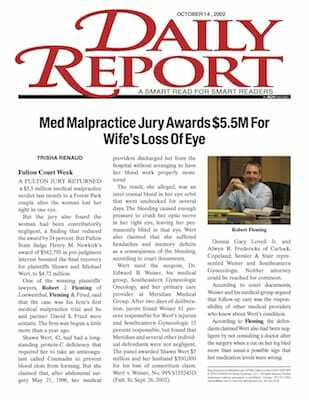 Robert J. Fleming took my case, filed suit, went to trial AND WON! While my case may not have been the biggest case he handled, Mr. Fleming worked extremely hard on my case. I had the pleasure of watching Mr. Fleming in the courtroom and I can honestly say that he could not have been more impressive. Not only did I recover the money for medical bills and pain and suffering that were asked for, we were awarded over $8,000 in attorneys' fees, which I understand is very rare in Georgia. Robert J. Fleming is the best!" 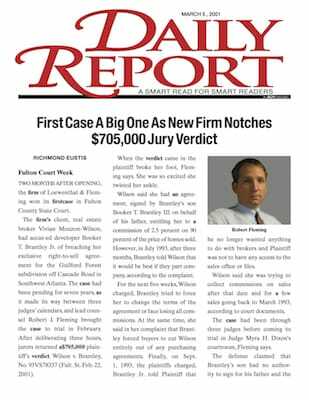 "Due to the defendant's stalling tactics, my case took several months to come to trial, but Mr. Fleming was always willing to discuss my case and took a personal interest in every aspect of my suit. He explored every angle, which meant very much to me after other attorneys had dismissed my case as too much trouble to pursue. Unfortunately, the facts of my case are sealed, but I believe I am allowed to say that Mr. Fleming did win a substantial amount for my injuries. If you want someone who will hear you out and "go the extra mile" to win your case, Robert J. Fleming is your man. I highly recommend Mr. Fleming. It was always comforting to know that he was on the case." "We have been working long distance on a case with Rob Fleming. We live in Arizona and the case is in Georgia. Being on the other side of the country, we were confident that Rob was representing us. He is a no-nonsense aggressive attorney. He kept us informed through regular emails and phone calls. We were always up to date and he personally explained all matters to us. Always willing to go the extra mile for us. We can't sing his praises loud enough! Rob, we can't thank you enough!" "Robert J. Fleming represented me in a medical malpractice case. Due to the doctor's not properly monitoring my coumadin therapy, I suffered a bleed and I lost vision in one of my eyes. Mr. Fleming tried the case before a jury in downtown Atlanta in the Fulton County Courthouse. It was such an intense experience to watch him try my case. It was a jury trial and it lasted almost two weeks. We received a multi-million dollar verdict. My husband Michael and I are so very grateful to have had Mr. Fleming representing us in the courtroom. I made a life-long friend and trusted advisor. There are so many good things to say about him. Rob is a top-notch Georgia injury lawyer: competent, thorough, remarkable, unbeatable, intelligent, personable, and easy to talk to. During the entire two week trial, Rob was prepared for every single question. He had a complete understanding of my injuries, how they occurred, the medical issues and the law. The defendants could not stump him, and believe me, they tried. He knew exactly what was going to happen and was prepared every step of the way. He changed my life."